Today’s IT teams are struggling to make sense of organizational data that has been compiled piecemeal and often stored within disparate storage solutions. Often this information needs to be aggregated and presented in a unified format, yet pulling data from multiple data sources and displaying it in a coherent way can be onerous and error-prone. The challenge is compounded when the data resides in different databases, and possibly within different clouds. To remedy this, companies often embark upon costly and time consuming data lake, data mart, and data warehouse projects. In many cases though, the IT team is simply looking for an effective solution to combine data within a single unified interface! 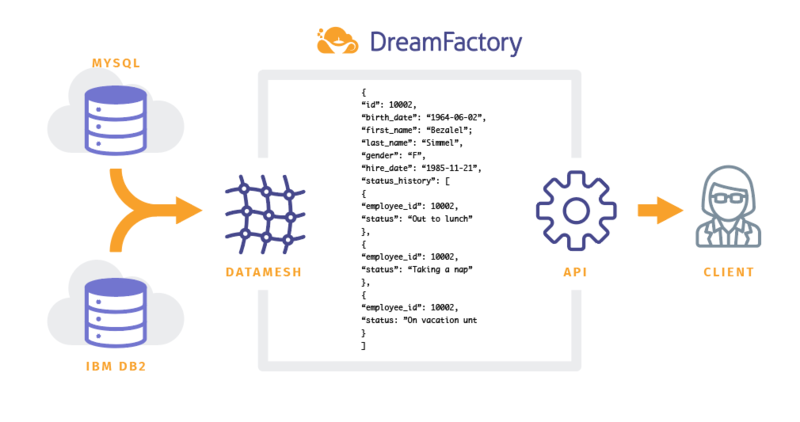 In this tutorial I’ll introduce you to a powerful and very popular feature of the DreamFactory platform called Data Mesh. Using Data Mesh you can create virtual relationships between two databases much in the same way you can create foreign key relationships between two database tables. We’ll walk through an example in which a MySQL database running on Amazon RDS is meshed with an IBM DB2 database running on IBM Cloud, merging the data together so it can be retrieved via a single API endpoint.